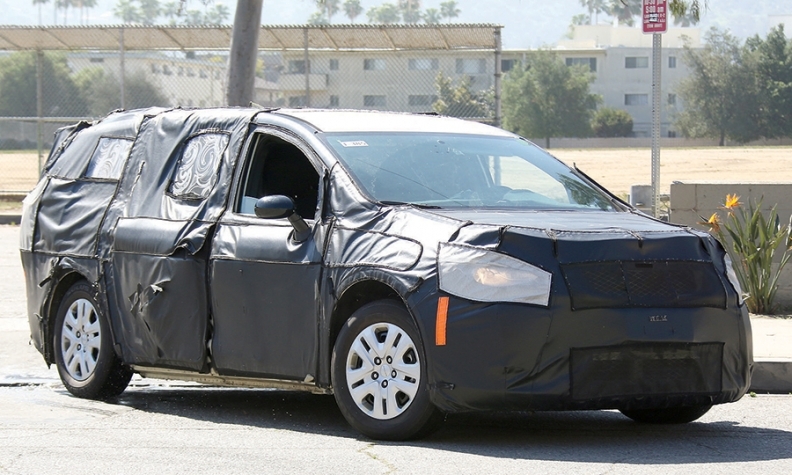 The next-generation Fiat Chrysler minivan, shown in this spy photo, is expected to debut in January. Before Fiat Chrysler can offer another all-wheel-drive minivan, it must electrify the rear axle or give up its popular collapsing seats, says CEO Sergio Marchionne. "You have two choices: You either trade the Stow 'n Go [for seats that don't collapse into the floor] or you go with electric motors in the back," Marchionne said last week. "It's not that complicated. We're exploring both." FCA is in the final stages of developing its next-generation Chrysler Town & Country minivan, which is expected to debut in January at the Detroit auto show. Chrysler offered awd versions before but dropped the option in 2004 when it introduced its Stow 'n Go collapsible rear seats. The seats fold into cavities in the floor, but the cavities block a potential path for a rear driveshaft on the otherwise front-wheel-drive vehicles. FCA has patented new versions of its Stow 'n Go seats that fold flat into the floor in a smaller space than the current versions, which are hinged at the front of the seat frame and tumble forward into the floor. It is unclear, though, whether the new seats will be incorporated into the coming minivan redesign. To get around the problem, FCA could use a single electric motor as a rear differential to power half-shafts going to the wheels, or use two electric motors to drive each rear wheel independently. Peugeot uses a similar single motor setup to drive the rear axles on its HYbrid4 vehicles.